Getting an HDMI signal over a big distance can be tricky. Suppose you wanted to run your connection for a hundred feet. The logistics of running a cable like that is the stuff of nightmares. In most circumstances, it would be nothing short of an ugly fire hazard. Even if it wasn’t, keeping signal integrity would still be tough. Going wireless lets you get around all kinds of problems. 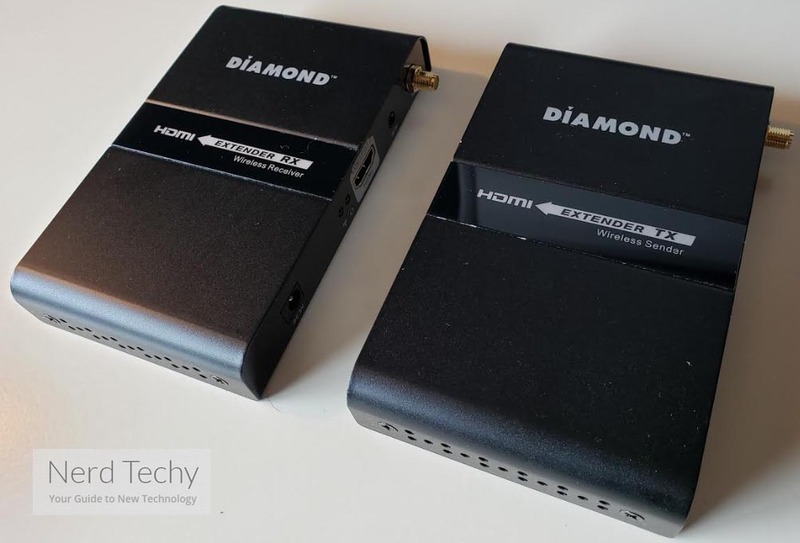 But picking the right wireless HDMI transmitter really depends on your ability to determine how far you need to send your HDMI signal. And to an extent, how complex of an installation you’re willing to undertake. When you pick a barebones HDMI transmitter kit, you can end up in some bad situations. Suppose you’re trying to use a transmitter and receiver that’s the size of a USB thumb drive, and there aren’t any included accessories in the kit. Doesn’t sound too bad, does it? At least, not until you try and plug one of the devices into the backside of a television. Suddenly it’s almost impossible to make line of sight between the transmitter and receiver. That’s when you realize your selection will underperform horribly, or will require you to go-out and get extra accessories. The Diamond V-Stream VS300M is basically one step above a basic kit. Because it includes everything you need to get a basic connection, and then it goes on to ensure the installation process runs smoothly. Of course, for people who are in nigh-impossible installation circumstances to begin with, this kit isn’t about to solve all of your problems. But if you’re trying to do more basic installations, like connecting a projector with a screen that’s in the same room, the VS300M can work quite well. Both the transmitter and receiver measure 3.7 x 4.7 x 0.8 inches. They’re primarily built from an iron alloy around a shell of ABS plastic, but the crystal panel is an exception. The outside of the chassis was sandblasted smooth before it was colored black. Together, both units weigh about one pound. Apart, about half a pound each. As mentioned above, this kit comes with everything necessary to help you get started. 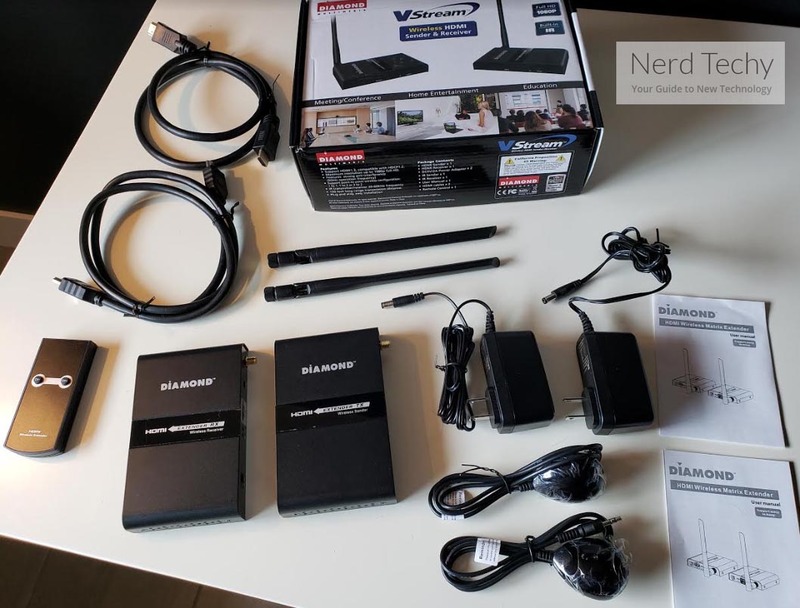 It includes the HDMI Extender TX sender, the HDMI Extender RX receiver, and a pair of DC 5V/2A power adapters. It also includes an IR blaster extension cable, IR receiver extension cable, user manual, and remote control. If it’s not clear, you can run those sender/receiver extension cables to make it possible to get a more direct connection between the units. Along the side of the HDMI extender, you’ll find a DC power port, HDMI input port, HDMI signal indicator, wireless signal indicator, and IR blaster extension cable interface. There’s also a large antenna, which can be removed and replaced if necessary. Along the front side of the extender sender, you’ll find a simple input switch, digital control button, and an IR control window. Superficially speaking, the receiver and transmitter are almost clones of each other. 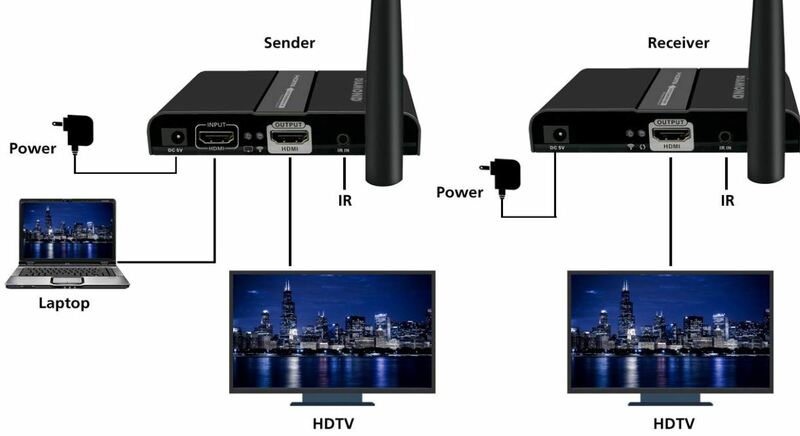 On the HDMI receiver, you’ll find a power port, pair of indicator lights, and an HDMI output port. It also has an IR receiver extension cable interface, and an antenna in the same position. Even the switch on its front side is the same. That switch helps indicate the input channel, which is necessary for syncing the two units together. Oddly enough, you have to actually pay attention to be able to distinguish between these units. Though there is a subtle difference in the logo for each unit, it’s really hard to see without taking a close look. If you plan on using your HDMI sender/receiver in a mobile capacity, it might be a good idea to wrap a piece of red tape around one of the units to help distinguish it. The VS300M is built around basic infrared technologies. IR pushed through the 20-60KHz frequency, so it isn’t interrupted by traffic on the populated 2.4GHz band. Your signal is transmitted with strong anti-interference capabilities because its sent across the 5G band. This kit is capable of supporting a simple point-to-point setup, or capable of being used in a two-way configuration with multiple transmitters. Control buttons on the sender/receiver allow you to set channels with the IR controller and switch, when then allow you to select input sources from the side of the receiver. The Diamond V-Stream provides a total transmission distance of about 150 feet. Why did they call this the VS300M instead of the 150-something? It’s a bit of a mystery. But if you ignore the confusing naming, you’ll probably agree that 150ft is suitable for most circumstances. The next step up means moving closer to 300ft, which can increase the cost of these devices by about 30%. It might be worth pointing out that if you decide you want to take that step, you can do so by upgrading the VS300M with stronger antennas. With respect to data transmission, you’ll find the highest available resolution is 1080p. It’s also possible to run lower resolutions as reduced as 480p. But the 10.2Gbps maximum bandwidth of this connection is capable of tearing through 1080p content like it was nothing. If you start using the IR blaster extension cables, things don’t really get any more complicated. You don’t need to undergo additional steps — apart from plugging in those cables. They basically work as a natural extension of the device. Fairly convenient. When you try and send this signal through obstacles like glass or walls, you will experience some signal loss. 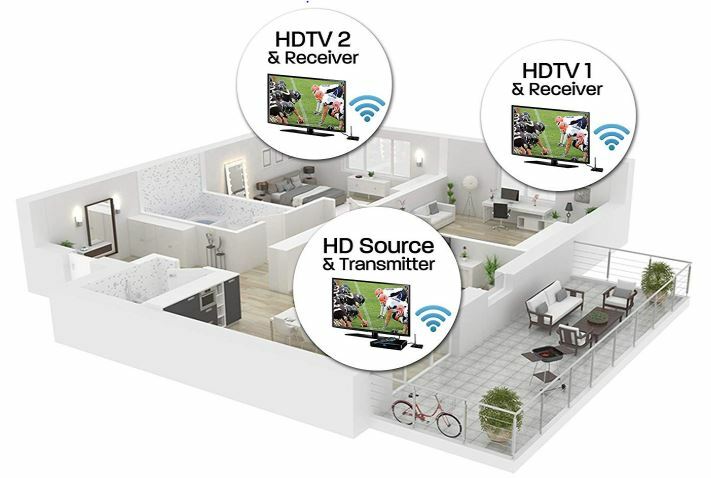 With thinner walls, the signal loss will only result in your signal becoming a little shorter. With thicker walls, you won’t be able to get a signal through at all. The 5G band has many advantages, but getting around physical barriers is not one of them. The device includes some pretty straightforward installation instructions. There are separate instructions for one-two style connections as opposed to matrix connections. No matter your intent, all types of installation have visual aids to make things a little clearer. Additionally, there’s a short FAQ section in the user guide as well that’s worth looking over. It can explain how the transmitter and receiver communicate with each other. And more specifically, how you can use the information provided by the LED indicators to diagnose potential problems. When you’re taking a signal and sending it across great distances, you’re going to encounter latency. That latency might be better or worse depending on your location. But with its anti-interference design, the Diamond VS300M can provide wireless latency is under 200 milliseconds. That’s pretty great for people who want to try playing games over the wireless connection. Though 200ms is still a bit high for someone who considers themselves a competitive player, it’s not high enough to get in the way of enjoying some causal play. Most people will hardly notice it’s even there, probably. Speaking of outdoor installation, this equipment may be made of waterproof materials like ABS plastic and metal… but it’s not properly waterproofed. More specifically, the ports aren’t actually protected from the ingress of liquid. If you plan on going outdoors, you’d want to position the unit with some level of protection. Like on a porch, or inside of a plastic shell. Though no such shell is included with the VS300M, it’s possible to use plastic shells without interfering with the IR signal. The trick is to find one that’s relatively thin and totally translucent. But if you’re trying to find something quick, even throwing a plastic bag over the transmitter or receiver would provide adequate shielding for a couple of hours. Assuming you’re not trying to play content from the inside of a typhoon. Incidentally, your signal will actually get a little worse if it starts raining heavily. Though the drop-off in connection distance shouldn’t be easy to feel, outside of torrential conditions, you’d really only expect to lose 5ft or so. Wind isn’t really an issue whatsoever, though that could change, should it start to kick debris into the air. If you happen to lose one of your transmitters or receivers, it’s possible to replace them individually. But unfortunately, Diamond’s receivers and transmitters don’t work when you’re trying to mix different types of series. You couldn’t get the VS300M to play-nice with one of their less powerful models, the VS100. The power supply is a pretty standard DC5V/2A configuration. The HDMI ports are compliant with HDMI 1.3 which means you’re not able to access higher levels of HDMI features, like 3D content. There’s HDCP 1.2 compliance, which ensure the Diamond VS300M won’t stand between your ability to stream copyright protected Blu-Ray discs, DVDs, or video streaming services. The machine itself follows standards for electrostatic protection, which basically means it’s unlikely to zap you with electricity. Its operating temperature ranges between freezing and 122°F, which shouldn’t be a barrier to most people. But it does mean if you’re trying to do some kind of fancy outdoor installation, you’d want to take your equipment inside during extreme fluctuations in weather. Who Should Choose the Diamond VS300M? The Diamond V-Stream VS300M is pretty close to an all-in-one style kit. What really helps distinguish it is all the extra installation accessories that are included. The extension cables in particular are great for allowing you to make a clear connection between the transmitter and receiver. Even when it’s not initially obvious how you can make line of sight, you can get the job done. But if you don’t actually need the extender/receiver cables, and you don’t actually need to reach 150ft, then you would be better served with a lighter unit, like the VS50. The Diamond VS300M was made for someone who does actually need to reach out towards 100ft+. Even if you have a pretty large TV, or a pretty unusual installation in mind, the VS300M can probably help you out.